Magwa, the most prestigious scholar of arcane antiquities, has spent his life traveling the Vast Kingdom in search of powerful and fascinating magic items. He has finally published a portion of his discoveries for you to peruse. His work includes over 30 of his hand-drawn sketches and the option to buy many more. It even includes the ability to randomly generate items, create your own, and save them for later use. Magic, right? The compendium is simple to use. With three options, (generate a random item, create a custom item, and view saved items) you can’t get lost. If you aren’t into creating items a handful of wondrous items are ready for you to use in the saved section. If you are the type that enjoys a surprise, whip up a random item with a single tap. 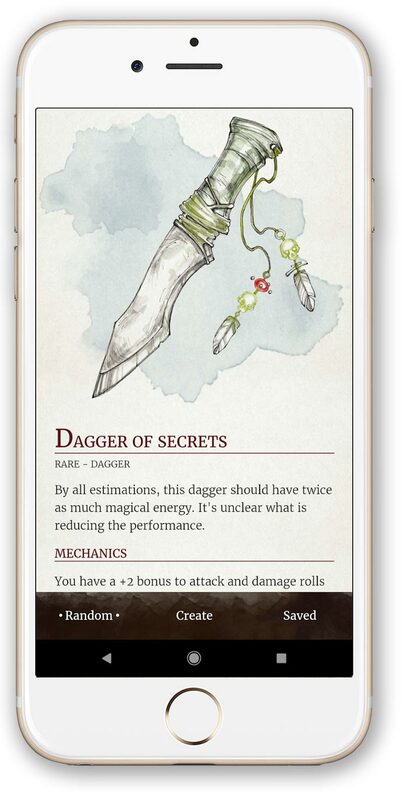 The app is compatible with 5e materials and even pulls some of your favorite magic items straight from the SRD via the Open Gaming License.